Sermon preached by Pliny H. Whine at Coventry, Vermont. Whine opens his remarks by addressing the severity of the loss of President Lincoln, the first president ever assassinated. He praises Lincoln for his personal virtues, public service, and personal magnetism. He also compares the death of Lincoln to other rulers in history and religious leaders like Moses, and what Scripture says on how to mourn such losses. Whine hopes that the sermon today will help pay respects to the fallen president, seek consolation and consider current duties in the face of turmoil. During the 19th century, it became popular to publish sermons in newspapers and magazines. Both the Union and the Confederacy reported increased religious fervor during the war. "Abraham Lincoln struggled personally with trying to understand the war in religious terms. Many, including Lincoln, came to see the war as a punishment for disunity and religious failures. A powerful theme of the sermons is the providence of God. Many people viewed Lincoln as a martyr, and often he was compared to Moses, Abraham, and George Washington. 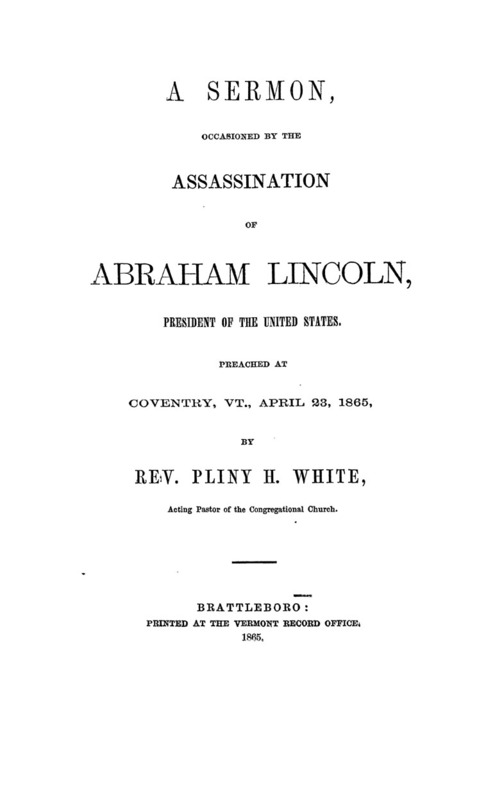 Lincoln's assassination took place on Good Friday, so most sermons about his death occurred that following Sunday at services." - The Martyred President, Emory University Libraries.